Crying "Baubles! and Linos! for sale, for sale oh"! The Big Season is upon us! I’ve been working hard on my submissions to the Comfort& Joy exhibit. Here’s a couple of sneak peeks (above, and at right). This exhibition runs November 29th – December 19th at the Gallery of the Craft Council of Newfoundland& Labrador. Always an impressive array of fine craftsmanship, it is sure to put you in the spirit! Between now and Christmas, there are four venues where I will be selling my wares in person. At three of them I will be selling my jewellery (and my beaded wire trees if I can find room to incorporate them into my booth). I’ve made a lot of brand new work this year, using etched antique maps, tree branches, and barnacles. 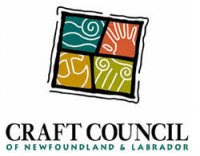 · Craft Council Christmas Craft Fair, November 20th – 23rd at the Art & Culture Centre. · Quidi Vidi Plantation Christmas Open House, December 6th (10-4), & 7th (12-4). · Anna Templeton Tea & Sale, December 12th – 14th. Exciting news this year is my foray into the world of printmaking! A few years ago I took an etching workshop to learn how printmakers etch so that I could bring some skills from a different artistic avenue back to my jewellery practice. I love crossing disciplines with technique in this way – I find it gives me a fresh angle to tackle my designs from. However, since that workshop I’ve wondered about trying out printmaking simply for the sake of printmaking. Over this past year I’ve been excitedly exploring this new medium, and am thoroughly enjoying it! The dilemma is that by its very nature, printmaking results in quite an output of prints (who knew!). So, in the spirit of embracing my inner business-person, I thought I’d try selling some of these prints. I’d love for them to find a home, and in the ultimate spirit of critique that is the public marketplace, I’ll learn if the prints I’m making appeal to others. · The Printer’s Fair, November 16th, 11am – 4pm at the Rocket Room, upstairs from Rocket Bakery.